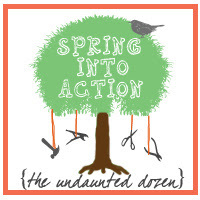 I have teamed up with eleven other blogs for a 'Spring Into Action - The Undaunted Dozen' project party. We will each be sharing a DIY project of some sort. This party will provide support and motivation to those who might feel overwhelmed or daunted by a DIY project or just require a little nudge to get things started and of course, to see the project to completion. I have decided to share my desk revamp. This is a project that is more important than any other current project in my house. The home office is where I spend a lot of time. The desk is where I tend to daily paperwork - pay the bills, manage piles of school notices - work from, study, blog and so on, therefore the need and certainly the urgency to give it a little face-lift. I started to evaluate the scope of this mini-project during the months of November and December last year. Life was getting busier and I needed a better organized system and a prettier space would be nice, too. I had begun the cleaning up at that point but do not have many good 'before pictures'. Here are glimpses of when I started to tidy up. A collection of random items - pens, pencils and scissors all in in one holder, a decorative plate made for me by my youngest daughter for Mother's Day a couple of years ago, an emptied letter holder. I had a bunch of notices, post-its, list of recalled children's medication, something from my youngest, again - her little pencil-drawn hand with my lipstick - a little of everything, pinned to that panel. I even had neighborhood recycling information handy! I brought in cleaning supplies. I cleared the back panel. These pictures were taken over several days so some things were moved around during the course of the day. I had just the desk light on so this picture is dark. You can see more items used daily like my hand cream, La Source from Crabtree & Evelyn and a blue-&-white coaster for my cup of tea. This is the color of the walls in the room, Benjamin Moore's, Mountain Lane. I had liked the effect of dark wood furniture against this olive-like green. My desk chair is very similar to this one from Staples. It is in a smoky grey faux suede fabric. I started to look at other colors I could incorporate in this space. I had purchased a few of these very pretty paisley clipboards to give as hostess gifts about a year ago. I decided I could keep one for myself. I thought this would be a great jumping off point to introduce a fun color palette and to breathe life into this space. So there you have it. My desk revamping 'Spring Into Action' project - Part I of III. Stay tuned for the next update on this which will be in a week on Thursday, April 12th. Now please do visit the other ladies who are a part of this project party. I am sure they would love a visit from the ever-supportive blogging community. Do let me know if you are also in the process of completing a DIY project. I would love to pay you a visit.